This 1921 house was a wedding present to Rudy Juenke-Stein. Many of the features are typical of the Stein built homes in that era. This large home is great for groups of families and friends. 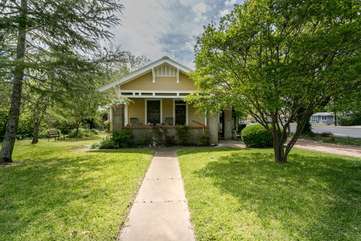 Located just three blocks from the heart of Main Street this large home sleeps ten people. Two rockers on the front porch await your arrival. Decorated with a musical theme guests will enjoy the combination of period antiques and new more comfortable beds and seating this home is designed to be casual, but has a feel of elegance. Inside the large living/dining room are both elegant and comfortable. The living room has a comfy sofa and chair placed to enjoy the large television with VCR/DVD. The room also offers a gas log fireplace for those cold winter nights (available October thru February). The dining table seats twelve people comfortably. A fully equipped kitchen is great for family and friend gatherings. It is equipped with range/oven, microwave, dishwasher, large refrigerator, coffeemaker and toaster. Two bedrooms have king beds both with quality mattresses and topped with handsome comforters. The third and fourth bedrooms have queen beds. The living area and another sitting area are both furnished with queen sleeper sofas. Two baths are located between the bedrooms and each has a tub/shower. Liedchen is the small cottage located next to Abendlied. A white picket fence frames the yard. This is a wonderful little home for two or three people to enjoy a quiet stay close to town. Inside the little cottage is a living room with a comfy sofa (3/4 size sleeper) placed to enjoy the television/VCR/DVD. A small table which can seat four is also found in the cozy little room. The kitchen has a coffeebar complete with large refrigerator, toaster oven, microwave and coffeemaker. The bedroom has an antique queen bed. The bath has a tub with shower.